Create a bookkeeper resume using our HR-approved downloadable sample and expert writing tips. 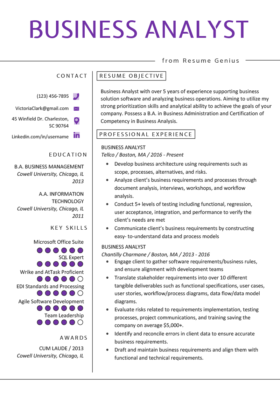 Or, save some time by using our quick and easy resume builder! General Bookkeeper with 5+ years of experience using both the single-entry and double-entry systems for medium-sized businesses. Aspiring to utilize my strong organization skills and attention to details to support the financial department of your company. Possess an associate’s degree in accounting. Performed financial calculations such as amounts due, interest charges, balances, discounts, equity, and principal for a multimillion-dollar company. Accessed computerized financial information to answer general questions as well as those related to specific accounts. Formulated, prepared, and issued bills, invoices, and account and financial statements with 10% increased efficiency to ensure timely deliverable. Corrected spreadsheet error saving A/P $3,500. Trained 3 new administrative assistants and junior bookkeepers. Operated 10-key calculators, typewriters, and copy machines to perform calculations and produce documents. Matched order forms with invoices, and record the necessary information. Performed general office duties such as filing, answering telephones, and handling routine correspondence. 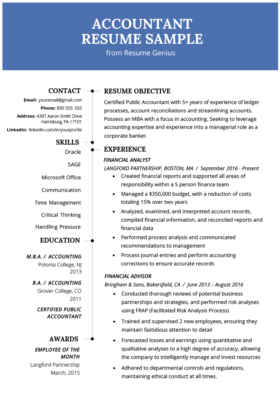 Proficient in Microsoft Office Suite (Word, Excel, Outlook, PowerPoint, Visio). Experienced with QuickBooks Pro and QuickBooks Online. The title of “Bookkeeper” is a very broad term. It covers positions responsible for basic office tasks such as data entry to much larger responsibilities like running entire financial departments. While some bookkeepers choose to work for themselves, many small and medium-sized businesses employ one to manage day-to-day accounting tasks. Some larger businesses employ bookkeepers as well to help support their accounting team. The average annual salary is around $37,000, but can range from as low as $22,000 to as high as $55,000 or more depending on how many responsibilities you are tasked with. Here are a few tips to consider while writing your bookkeeper resume to help you maximize your success with securing quality interviews. Hiring managers and those responsible for screening potential candidates know what they are looking for. They are highly efficient at quickly scanning the hundreds of resumes they receive and keeping only those that match their needs. Make sure you mention whether you are a General Bookkeeper, Full Charge Bookkeeper, or a Certified Bookkeeper. These are titles that HR keeps an eye open for. In order to make sure you make it through that initial process, you’ll need to let them know you have the skills and experience that they desire. Make sure you mention whether you are a General Bookkeeper, Full Charge Bookkeeper, or a Certified Bookkeeper. These are titles that HR keeps an eye open for. Just keep in mind that they will want verification, especially if you are certified. You will also want to highlight the type of system that you’re accustomed to working within. Many smaller firms use the less complex single-entry bookkeeping method, so while it’s not as specialized, listing that skill opens a lot of doors. Alternatively, having experience in the double-entry method allows you to interview for positions that those without such experience cannot. And, if you can do both, definitely stress that. 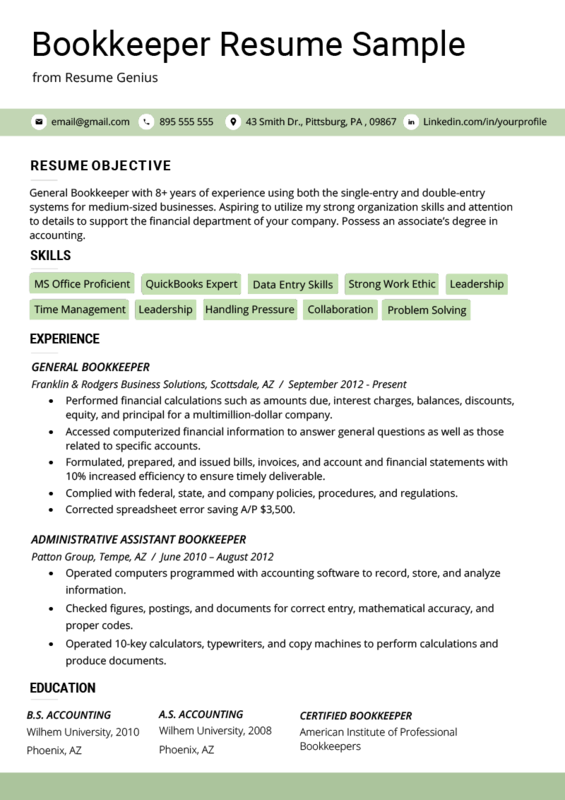 General Bookkeeper with 5+ years of experience using both the single-entry and double-entry systems for medium-sized businesses. Lastly, include a brief line about how the skills you possess will benefit the company. A hiring manager is interested in what you can do for the company, not about your personal career goals. If you have any formal secondary education, you can include that here as well. 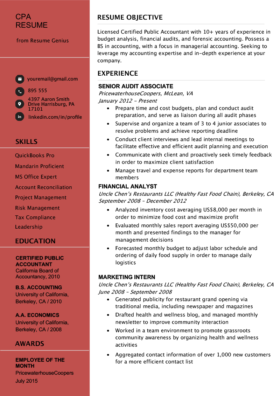 Aspiring to utilize my strong organization skills and attention to details to support the financial department of your company. Possess an associate’s degree in accounting. The main purpose is to include any and all of the basic job requirements in the career objective section so that HR departments can quickly see you’re qualified and add your resume to the short list instead of the trash can. Bookkeeping and accounting are jobs that are easy to show your value. In the “Professional Experience” section, the easiest way to show how you can help a potential employer is to not only explain your previous responsibilities, but to also stress how successful you are with those responsibilities through quantifiable numbers. There are a couple of ways to do this. There’s a huge difference between maintaining financial records for a small business with a 5-figure annual revenue and one with 7 or 8 figures. Another great way for a bookkeeper to emphasize their worth is to explain how they saved their employers money, either from improving efficiency or by catching and correcting errors. Our applicant uses exact numbers to show her value, and that is sure to catch a hiring manager’s attention. Saved company money by correcting spreadsheet error. Training colleagues portrays a sense of teamwork as well as a certain level of competency. By presenting your accomplishments with quantifiable numbers, it helps recruiters, HR departments, and hiring managers get a better idea about what you bring to the table. For more help with using action words and quantifying your achievements, click here. Help your resume stand out by including targeted action verbs at the beginning of your bullet points that are related to bookkeeping. Remember, include verbs that apply to the specific position you are applying to. For example, for management positions, use more leader-oriented words. For an entry-level position, include more teamwork-oriented verbiage. *View the universe’s longest complete list of action verbs here for more ideas! While it’s almost a given that any potential applicant will have accounting software experience, you should still list all of the relevant applications on your bookkeeping resume. When including software suites, make sure to list each separate program by name. Using QuickBooks as an example, clarify which versions you are experienced with. Preparing a bookkeeper resume that’s laid out in a logical manner, includes quantifiable measures of your success, and specific details on your relevant skill set makes it much easier for a hiring manager to consider you as a serious potential candidate.